If you like jewelry and pearls in particular, and browse the niche market and magazines frequently, then you may have heard of Akoya pearls quite often. It’s a name that tends to spring up around specialized hubs and expert shows, but it doesn’t refer to any newly discovered or exotic species of pearls. 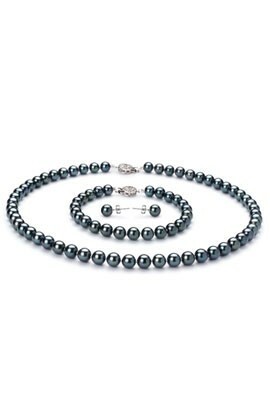 In fact, the Akoya pearls are cultured pearls, by their more official name. The element of novelty comes only from the fact that people have known them for a long time as ‘cultured pearls’, on a popular culture level, and only recently have started calling them Akoya pearls. We will give you a short list of the top 10 tips on wearing and accessorizing Akoya pearls, and then wrap it up with a brief presentation on how Akoya pearls came to be in the first place. The first part of our ultimate guide will also tell you how to Since Akoya pearls are actually the more budget-friendly sisters of natural pearls and the beauty of a classic rope necklace or earrings never goes out of style, they should be the go-to choice whenever you’re shopping for pearl jewelry. If you’re just starting wearing pearls in general (or if you haven’t worn Akoya pearls so far), this is what you need to know for a flawless style and the easy maintenance of your pearls. If you’re not a habitual pearl wearer (or the person you’re shopping for isn’t), then maybe it’s best to start with smaller Akoya pearls. These will look discreet and will contribute to a classic charm without feeling too over-the-top or needing much else in order to balance your overall look. Stick to the size of 6-8mm for your first strings of pearls and maybe move on to more impressive statement pieces in the future. The most popular choices for first-time buyers of Akoya pearls are bracelets and necklaces, but don’t neglect the impact a classic pair of earrings or a ring can have. Once you make up your mind and prepare to order your jewelry, make sure you trust the source of the pearls first. Both online and offline stores should make the sources for their cultured pearls transparent and available for any interested customer. The advantage of online stores is that you may be able to find the jewelry you want for a lower price, either because they are usually more affordable or because they can offer impressive discounts regularly, or are sold under a wholesale program. Anyway, you should be able to find Akoya pearls at a much more affordable price than traditional natural pearls. The other option for budget-friendly pearl jewelry is the freshwater pearl, but a comparison between Akoya pearls vs. freshwater pearls will point out that the Akoya variety is much rounder and shiny than the more humble freshwater variant. This is why the Akoya pearls are the most popular choice for pearl enthusiasts everywhere. A beautiful piece of pearl jewelry can have a long life if properly care for and maintained. It isn’t complicated, you just need to know how to store your pearls when you’re not wearing them and what actions are necessary from time to time. After a few years of wear or when you notice the necklace or bracelet has gotten a bit loose, you should take your Akoya pearls to the jewelry shop and ask someone to restring them. Also, never spray on perfume while already wearing the pearls, as the alcohol can damage them. Think Audrey Hepburn in Breakfast at Tiffanys. If you’re having doubts as to what to wear your new strand of white Akoya Pearls with, a classic black dress is always a fine option. Of course, there are plenty of different types of black dresses, so this pre-made outfit can definitely still have room for improvising. Red lipstick is also a classic fit to any pearl jewelry. Akoya pearls shine best in a necklace (and a bracelet, preferably), and that’s also what customers buy the most when it comes to pearl jewelry. A rope pearl necklace is very different from a classic strand and even more different from a choker necklace. If you’d also like to have a pendant on your string of Akoya pearls, then the style of the necklace changes again. Look into all models to be able to decide which one would fit your style best. Akoya pearls are graded according to the quality of their nacre and luster. They can be either A, AA, or AAA (the latter also being the most valuable grade of the three). A fine string of pearls is indeed a classic choice, but where would fashion be without a bit of boldness and creativity every now and then? Blue is an unusual color for Akoya pearls, but also a delicate and feminine one. Try a strand of blue-hued pearls, like in the picture here, or a pair of discreet stud earrings. Our set of exquisite black Akoya pearls. If you’d like to take your pearl preference even further, choose a pair of earrings with black Akoya pearls. The color may feel too daring for a necklace at first, which is precisely why you may feel earrings are a better option. A cluster of black pearls for each earring, or a necklace with a large black pearl pendant are particularly classy choices, although a set of pearls like this one will always steal the show. This is also a refined touch to your usual pearl jewelry. Definite try a bracelet in a mosaic of colors, like this, once you get more comfortable with wearing various types of pearls. Your necklace or bracelet don’t have to be full of pearls. Try wearing one with chain details and only a few pearls here and there for a unique effect. The creator of Akoya pearls was the legendary Kokichi Mimikoto, who also started the pearl industry and the famed Mimikoto jewelry company, enjoying cult-icon status in the world of luxury fashion to this day. This Japanese entrepreneur is credited with having created the first cultured pearl in 1893, but the pearl was far from perfect yet. After various improvements stretched out over a few years, by the beginning of the 20th century (in 1905), these cultured pearls have already achieved their perfectly spherical shape, identical to the most prized natural pearls. Mimikoto created the basis for the Japanese pearl and jewelry industry, and is now counted among the top 10 Japanese inventors (and since Japan is arguably a land rich in innovations, this says a lot). The perfectly spherical cultured pearls that were managed to be cultivated due to Mimikoto’s research have been since known as Akoya pearls (due to the name of the pearl oysters used to cultivate them). According to the official Mimikoto portal, Akoya pearls come in the range of 6 to 8 mm and they are among the most popular pearl products in the world. This entry was posted in PearlsOnly and tagged Akoya Pearls, style tips by PearlsOnly Team. Bookmark the permalink.